Metro Rapid Line 733 along Venice Boulevard, between downtown L.A. and Santa Monica, debuted Sunday as a way to get to the beach faster. Or to work faster, if you must. 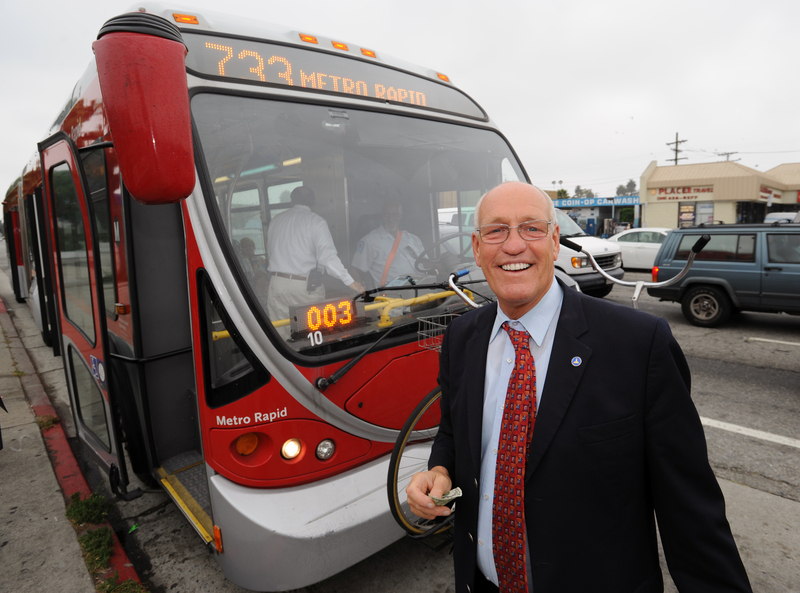 Who knew come Tuesday, Los Angeles City Councilman Bill Rosendahl — who represents Venice and other Westside communities — would hop aboard for his commute to City Hall to promote the new line that runs every 10 minutes during rush hour and every 15 to 20 minutes during off-peak hours, 5 a.m. to 11 p.m.
“I hope everyone can soon take advantage of this convenient bus line,” Rosendahl said, also mentioning that he has advocated for the new line since he was in office. Metro Rapids make fewer stops, provide frequent service and access a city-wide bus signal priority system that allows them to move faster through even daunting traffic. And who in this city wouldn’t enjoy a commute that’s even a tiny bit faster?